How Do You Say 'Butterfly' in Different Languages? Do You Wonder: What Eats Butterflies? Insects > Butterflies > How Do You Say "Butterfly" in Different Languages? Have you ever wondered how do you say “butterfly" in different languages other than English? Butterflies are such beautiful, graceful, charming, and heart-warming creatures, it is no wonder that so many people are so very interested in them. Even the word itself in English evokes a feeling a charm and warmth. You see or hear the word “butterfly," and you naturally think of something mythical, even magical, and undoubtedly special. Of course, by themselves, “butter" and “fly" do not evoke such warm sentiments. They only make you think of a spread and, at best, something airborne; at worst, the word “fly" on its own makes you think of pesky, winged, buzzy insects that like to dive bomb you out of nowhere, especially when you are hot and sweaty. Before answering the question, “How do you say 'butterfly' in different languages?" you first need to understand why they are known as “butterflies" in the English language. Some people believe that butterflies got their name because their wings look like they have a texture as soft as butter – and they fly, of course, so thus: butterfly. It is also suggested that because so many are a yellow color that it reminded people of butter. In French, the word “butterfly" translates into the wonderfully melodic, rolling “papillon." Have you ever seen the breed of dog known as the Papillon? If you see this dog from the back, you will no doubt notice that its long, full ears and the markings on them resemble a butterfly with its wings spread. In the Filipino language, “paruparo" means butterfly. 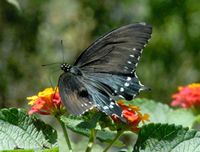 People in Portugal call butterflies “borboleta," while in Spain, Mexico, and other Spanish speaking countries, the winged darlings are known as “mariposa." If you spot a butterfly while you are in Germany, you call it a “schmetterling," which is charmingly lyrical. It sounds like the kind of creature that belongs in a book by Dr. Seuss! The Italian translation is quite beautiful as well: when in Rome, do as the Romans, and call the butterfly a “farfalla." Those who speak Romanian know the butterfly as the “fluture," which sounds exactly like it looks – like you are saying “future," but with an L in it. If you find yourself in Lithuania, make sure to point out the beautiful “drugelis." If you are speaking Danish, then you are seeing a “sommerfug" whenever you see a butterfly.